Another Uproar? Danish Zoo That Culled Giraffe Kills A Family Of Lions : The Two-Way Two cubs and their parents were euthanized to make room for a younger lion. The zoo had already come under fire in February for euthanizing a young, healthy giraffe and feeding it to the lions. 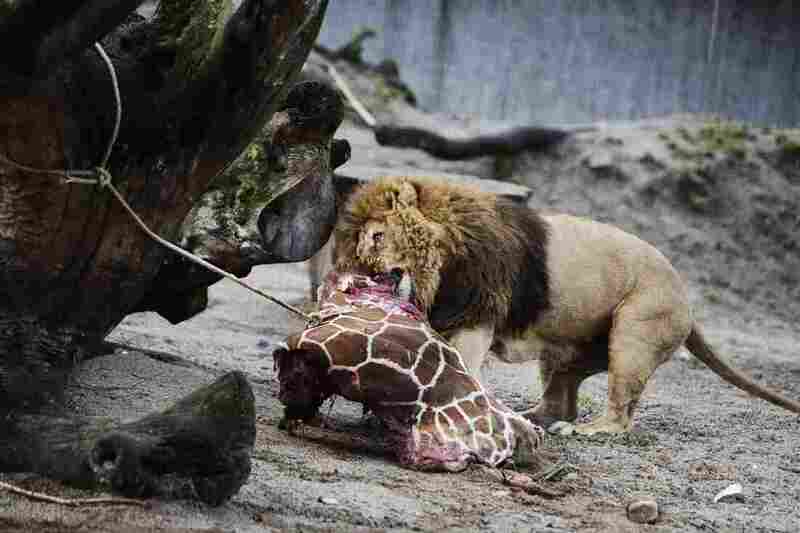 The lions at the Copenhagen Zoo eat the remains of a healthy young giraffe named Marius in February. It's unclear whether the lion pictured was one of those euthanized. The same Danish zoo that euthanized a young, healthy giraffe it didn't need for its breeding program has killed a family of lions to make room for a younger, male lion. If you remember, the Copenhagen Zoo caused an uproar when it put down "Marius," performed a public autopsy and then fed its body to the lions back in February. The scientific director told All Things Considered at the time the zoo had euthanized the giraffe to prevent inbreeding. This time around, the BBC reports, the zoo had not received any offers from other zoos to take the lions and it did not perform a public autopsy.
" 'Because of the pride of lions' natural structure and behavior, the zoo has had to euthanize the two old lions and two young lions who were not old enough to fend for themselves,' the zoo said in a statement. "According to zookeepers, the male cub 'would have been killed by the new male lion as soon as he got the chance.' "
The AFP reports the new male will be introduced to the zoo's two female lions, who have just now reached breeding age. The wire service goes on to quote Chief Executive Steffen Straede as saying, "The zoo is recognized worldwide for our work with lions, and I am proud that one of the zoo's own brood now forms the centre of a new pride of lions." We are not whether the euthanized lions were also the ones who got to eat the giraffe.